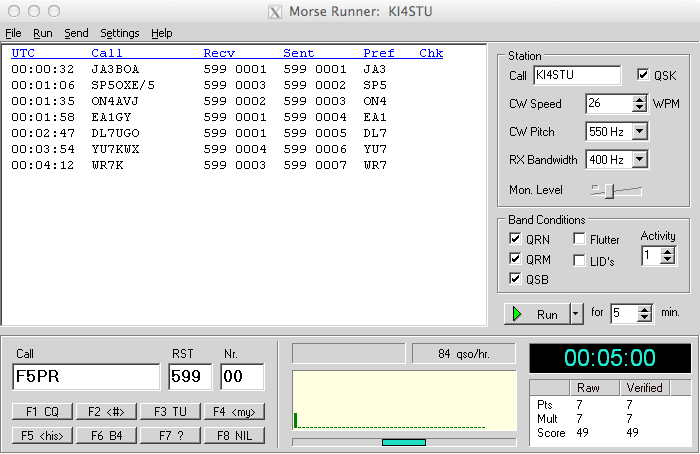 Morse Runner is a Windows-based contest simulator developed by Alex Shovkoplyas, VE3NEA. Using Wineskin, it has been successfully and seamlessly run under OSX, and made available here for download. Sure, you could use Wineskin to do this yourself (and save me some bandwidth), or you can pull the ready-made dmg from here. After downloading, open the file. Drag Morse Runner to your Applications folder. The application should run successfully without further configuration. Note: it will not curently run from within the dmg file, it will need to be installed locally. Optionally, the MorseRunner.ini file may be edited to customize some settings. Most (all?) of the settings within this file can also be set within the application itself. If you wish to edit MorseRunner.ini, take a look at the OSX Readme inside the dmg. Further details about the settings available within the application are documented in the OSX Readme. This file is nearly identical to the original Readme from VE3NEA, other than the OSX-specific installation and uninstallation instructions. uncheck the Auto Detect GPU for Direct 3D. If it doesn't launch cleanly for you and you need help trying this adjustment, drop me a note. If you have questions or comments about using this application under OSX, please email them to ki4stu k4iz at arrl dot net.